– The ability to solve problems and make decisions. – The ability to regulate emotions. – The ability to collaborate with others. – The ability to facilitate change. This short article is based on neuroscience literature, as well as findings generated in the WIO-EADA NeuroTrainingLab. The NeuroTrainingLab (NTL) was founded with the purpose of diagnosing and developing socio-emotional competencies in managers and professionals. It is a methodology that draws on new advances in technology, education, psychology and neuroscience and aims to train professionals adapting and refining thoughts, habits and emotions that underlie leadership behaviours. The NTL provides a direct, case-based experience in interaction with an actor, (self-) observation, systematic feedback and coaching to help participants achieve their goals. The NTL allows us to observe and closely analyse leaders in action, both through observable behaviors and neurophysiological (EEG) activity. The NeuroTrainingLab is led by content experts who evaluate leadership competencies and provide neurocoaching. They are responsible for guiding the development of each individual or team involved in the programme. The NTL also requires the contribution of experts who collect and analyse data using multiple technologies (audio, video, biometrics and neurophysiological), allowing a view of both intrapersonal and interpersonal activity, and actors specialised in improvisation, working within a character and script, but naturally interacting with participants. These actors have a very important role in causing tension in the simulation, in order to observe leadership resilience under stress. Additionally, they provide feedback about the emotional impact of the participant, something often lacking in developing selfawareness of managers. The NTL has been used in different programs at EADA Business School (like the EMBA, GEMBA and International Master in Leadership and Organisational Coaching), and in different companies. These are some of our findings. In English, the term “quiet” has different connotations, which together represent a range of characteristics and typical values of sustainable leadership. These connotations form the basic structure of Quiet Leadership (see figure 1 overleaf). A first lesson we can draw from cognitive neuroscience is that the capacity of our working memory, managed by the executive part of the brain, the prefrontal cortex, is quite limited in its ability to process data. We use our working memory to keep “in mind” for a limited time the information that is entering through the different senses. In order to process or store information we need to maintain the focus of our attention long enough to associate new information with memorised data and apply some algorithm or mnemonic to technique to turn it into knowledge stored in long-term memory time. Taking into account that today one of the biggest challenges of business leaders is to manage constant interruptions, maintaining focus is a challenge. In fact, even if we have the perception of being focused on a task, the mind actually triggers some internal conversations, associative thoughts or distractions caused by our body, which is continually self-regulating itself. Many managers think they can compensate for this loss of productivity with multitasking. This idea turns out to be misleading. Multitasking activity is not possible, unless we combine a cognitively demanding task with an automated activity that no longer requires our full attention. We can only process one new idea at a time. Neuroscientists have shown that multitasking actually consists of many micro-interruptions and constant changes between one task, routine or sequence and another, which leads to “switching costs”. These switching costs maybe cost less than a second at a time, but are so common (and unconscious) that in the course of a day they can literally mean accumulate in hours of lost productivity. 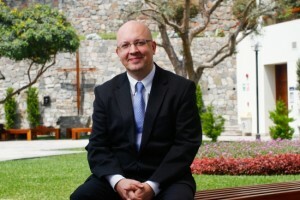 Steven Poelmans, is a Professor at EADA Business School and Director of the Coaching Competency Center. – Manage themselves, protecting themselves against interruptions, maintaining focus, re-focusing and maintaining a mental discipline of concentration. – Self-regulate, keeping the focus on the other person while talking, using active listening techniques, which is first of all, an act of will. It requires a mindset to appreciate the information that the other person can bring, and to show true interest in their experiences and ideas. – Protect their team, filtering information to avoid distractions, confusion or information overload. They manage their teams, establishing rules and processes within the team, related to the distribution of time between team members to ensure that everyone can express themselves and absorb all the necessary information. Discourage mutual interruptions, provide questions and summaries; facilitate, clarify and report in writing so that there are repositories of knowledge that can be consulted by later generations in the organisation. – Manage their departments, ordering the tasks and responsibilities to facilitate information exchange, streamline collaborative processes and avoid unnecessary duplications or lack of information. 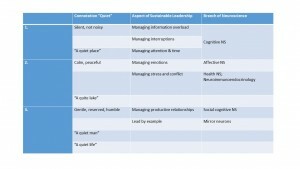 In conclusion, an important feature of Quiet Leadership is to be “quiet” in the sense of being silent, discrete and disciplined while managing information and interruptions to ensure optimal use of scarce, critical and valuable resources in the knowledge society: attention, memory and analytical skills. – Manage stress in themselves and others, by recognising and expressing emotions in themselves and others. They are capable of relaxing themselves and keep tensions at a manageable level. – Find new solutions to complex business challenges. Creativity is directly related to the level of arousal and humor. Great leaders encourage exploration and play, identified by affective neuroscientist Jaap Panksepp as basic positive emotions systems that are extremely important for our survival and happiness, intrinsically rewarding activities that are suppressed if we perceive a threat. – Manage the perception of threats and risks, and therefore, the comfort and well-being of collaborators. In conclusion, an important facet of Quiet Leadership is to be calm and serene in the presence of stress, conflict, crisis and adversity, to ensure the optimal use of scarce and critical resources, like our serenity, composure, ability to maintain perspective and our synthetic and creative intelligence. In conclusion, an important facet of Quiet Leadership is to be calm and serene in the presence of stress, conflict, crisis and adversity, to ensure the optimal use of scarce and critical resources, like our serenity, composure, ability to maintain perspective and our synthetic and creative intelligence. Several studies in the field of social-cognitive neuroscience have revealed that the operational system of our brain is social. It operates on the simple principle of avoiding threats and seeking gratification, and social threats and rewards are especially impactful in humans. Studies have shown that social pain (a result of being marginalised, excluded or humiliated) activates the same centres in the brain as the ones we use to experience physical pain. Studies have provided clear evidence that the human brain is highly sensitive to perceive irregularities in social status, security, autonomy, relatedness and justice. Strong negative emotions associated with these values can incapacitate individuals to think straight, and spread quickly in the organisation. We can observe the effects of emotional contagion every day in stock market fluctuations, mass migrations of people fleeing wars or mass street protests. Very relevant for social relations in enterprises has been the discovery of mirror neurons. First described by Italian researchers, mirror neurons are the psycho-neuro-physiological substrate behind many phenomena such as learning through observation, imitation processes, visualisation and empathy. We acquire much of our skills through observation and imitation of other human beings. It is a basic mechanism underlying learning of children, but also of business leaders. The best way to develop leadership behaviours in people is making sure they have leaders who are credible and competent models. – Pay particular attention to stimuli in the workplace that can cause strong social reactions in employees. Intervene immediately in cases of interpersonal conflict. – Always take into account both business optimization criteria (profitability, productivity, innovation …) and social criteria (status recognition, security, autonomy, cohesion, justice …). – Model desired behaviors by example. – Align continuously expectations of people to avoid perceptions of social neglect. In conclusion, an important aspect of Quiet Leadership is to be “quiet” in the sense of being humble and discrete, avoid big words and false promises, avoid at all costs contradictions between words and behavior and lead by example. This facet of sustainable leadership is needed to ensure the optimal use of scarce resources critical for social behavior in organisations: respect, trust and admiration, the foundations of intra-and inter-organisational collaboration. In the knowledge society the primary factor of productivity is no longer labour force, but brain power. We need leaders with high levels of cognitive and emotional intelligence, to deal with the constant pressure of the environment, maintain focus and energy to develop people and manage organisations. In this context, NeuroLeadership is a new field of research and praxis of sustainable leadership with the brain in mind. Quiet leaders are discrete observers and serene models in an environment in constant flux. We invite managers and professionals to adopt a neuroscientific basis for understanding and exercising leadership and encourage scholars to develop specific, relevant and rigorous studies to support the practice of neuroleadership in organisations. From a historical point of view, the study of the brain may have only just begun, but the relevance of science and praxis of neuroleadership is evident in a society that is increasingly based on knowledge and interpersonal service orientation.